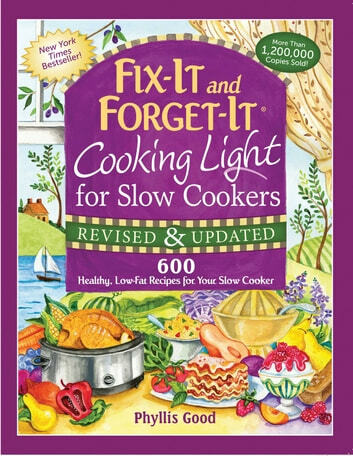 Millions of home cooks have fallen in love with the Fix-It and Forget-It cookbooks since the first title was released more than a dozen years ago. Now, these same beloved cookbooks are available in a larger format, making the recipes easier than ever to follow! This favorite guide to quick and easy-to-prepare slow-cooker food has sold more than 1 million copies. It is possible to have it all: food from your slow cooker that is scrumptious and low-fat, and convenient to make. Here are 600 recipes that are mouth-watering but guilt-free. Now you can choose healthy, light dishes, fix them quickly, and then forget about them until mealtime. With each recipe in Fix-It and Forget-It Lightly: Revised and Updated, comes an analysis of its calories, fats, and carbs, as well as what it contributes to your daily vitamins and nutrients. You can feast healthfully-with a minimum of time and fuss. Your family and friends-your waistline and your heart-will thank you.